Carolina Custom Blinds has been in business since 2004 and is locally owned and operated. 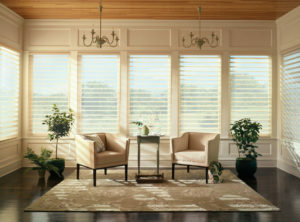 We are a “shop at home” business and carry a full line of Hunter Douglas blinds, shades and Norman Plantation shutters. We bring our products to you so you can see what they will look like in your home or office. Everything is custom measured by us and designed by you. From new construction to home renovation, we can help you find a solution that you will be happy with for years to come. All of the products we carry have a lifetime warranty on all working parts, and we guarantee the best customer service in town. Please contact us to schedule your consultation.